Jesus arose, and rebuked the winds and the sea, and there arose a great calm. In this season of Epiphany we are coming to know Jesus as: the King of Kings (Epiphany); the Wisdom of God (Epiphany 1); the Messiah who brings in the Messianic Age (Epiphany 2); and as one who can heal souls and bodies (Epiphany 3). Today our readings continue to expand our vision of Jesus Christ. We are, like the disciples seeing more and more of what Jesus could do, and learning what this means about who he is. in the Gospel [St Matthew 8:23-34] there are two miracles, the stilling of a storm and the healing of the two demon possessed men – showing Jesus is Ruler of all things visible and invisible. And in the Epistle [Romans 13:1-7], St Paul reminds us of God’s providential care of humanity through earthly powers, earthly governments. Let’s look first at the miracles. First, the calming of the storm. The disciples had faith, they went to Jesus to save them. But it was “little faith”, in that, they had allowed themselves first to become completely upset, terrified of death. Do you see how they allowed the circumstances of the outward storm to overwhelm them inwardly, they allowed the storm without to become the storm within, before they finally go to Jesus. Isn’t this often the way with us – that we have faith in God – we come to worship regularly, and then some circumstance happens around us – something beyond ourselves, and we allow it to overwhelm us inwardly with confusion and fear. It is as if we forget or think God doesn’t somehow have power in that situation or has abandoned us. e.g. In the parish I served in Nova Scotia there was a retired captain of a fishing vessel, Cp. Albert Parsons. He described to me a time when his vessel was caught in gale force winds and the waves where gigantic, the can rise to 10 or 20 meters in height from trough to crest – taller than the ship he was in. He was very aware of the threat to his life and the life of the men on board, and his responsibility. He was in these waves for hours, and as each wave came before him, in his terror, he made the sign of the cross. 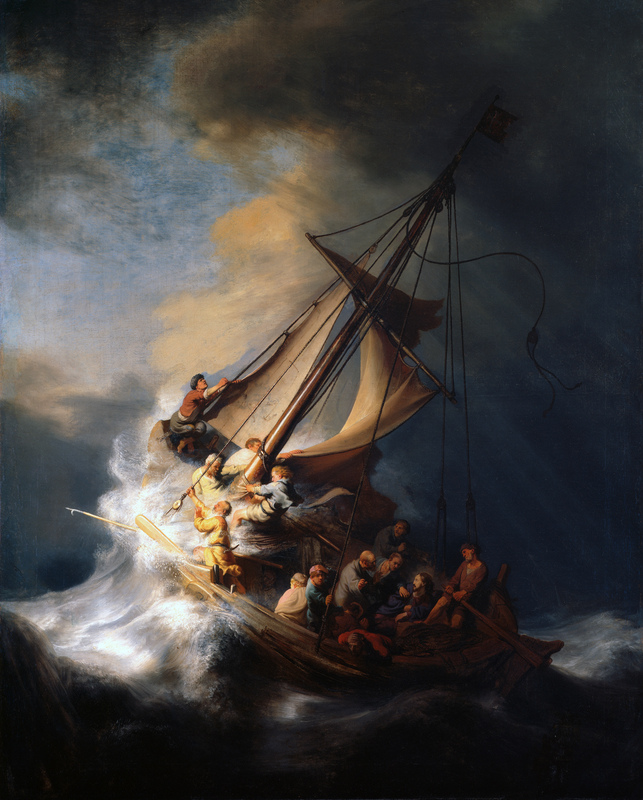 It recalled him to Christ, who gave him the courage to be steady in guiding the ship, he believes Jesus saw him and his crew through the storm. We might not face such outward physical terrors, but we do or will face outward circumstances in our lives that are inwardly overwhelming: the death of a loved one, perhaps the betrayal of a lover or friend or family member, perhaps being confronted with deep malevolence or other shocks to our worldview that completely throw us. In those moments, we can recall Jesus, maybe make the sign of the cross, pray the Lord’s Prayer, seek to be close to the God who dwells in our hearts to give us steadiness, to bear with the terror, the grief, the anxieties as they arise. Jesus may also guide us to the right person for help. In the second miracle, the ship has arrived at the other shore. Jesus and the disciples are met by two men who are possessed with demons. The account says that these two men were exceedingly fierce, so that no one could come near. They are dwelling among tombs, in the cemetery, showing how they could not abide with the living but are at the point of death. 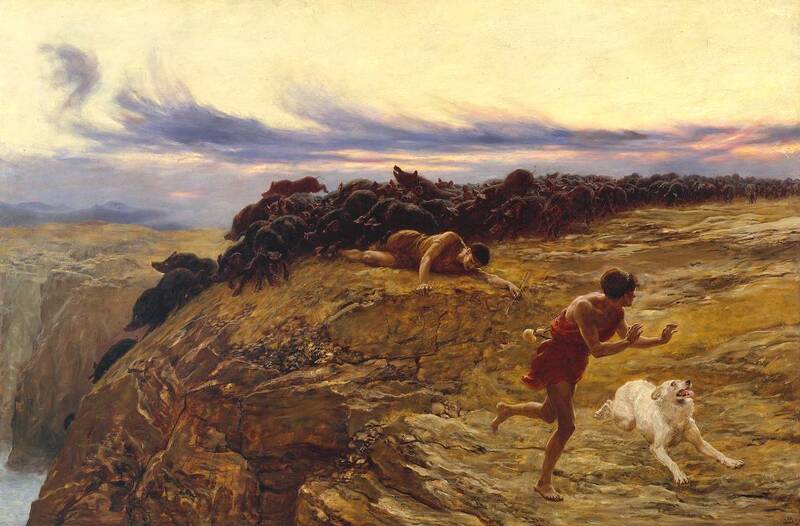 Jesus, who brings immediate judgement on these demons by his presence, allows them to leave these men and go into a herd of pigs – who are then led to their deaths falling headlong into the sea. In the other Gospel accounts, we learn that immediately afterwards, the man who was possessed was clothed, and in his right mind, and sitting at the feet of Jesus [Mk 5:5; Lk 8:35]. The situation reveals the nature of Satan as one who comes to bring confusion and terror and to destroy life, and, by contrast, of our Saviour who has power to bring clarity of mind, peace, and new life. What are we to make of demon possession? Demonic possession is something very rare in Christian countries, but it does still happen – the Anglican Church does have Exorcists appointed in every diocese. But it is in mission fields in non-Christian countries that stories mostly come to us today, of people falling down in the face of Christ’s disciples and revealing themselves to be possessed and then being delivered by the power of God. For one thing, we see the great storm within a soul caused by the spiritual forces of wickedness. It is the devil who delights to torment souls inwardly, God comes to us to bring inward peace. In today’s Epistle [Romans 13:1-7] we are reminded of the good of government in the establishment and building up of great societies. Society would not work without our trust in government. God is a God of order, and the right ordering not just of souls but also of society. Let every person be subject to the governing authorities. For there is no authority except from God, and those that exist have been instituted by God. But this is not a carte blanche for governments to do what they will. This passage has been used by tyrannical regimes to assert unlawful authority. Remember that Paul wrote this at a time of tyrannical Roman emperors who began to persecute the Church, in fact, tradition holds that St Paul himself was put to death under the persecutions of Nero. St Paul places limits in this passage – legitimate authority is not to be “a terror to good conduct”, but legitimate authority “carries out God’s wrath on the wrongdoer”, and bears the sword “not in vain.” But if a ruler uses the sword for vain pursuits, or to punish those who do right, or to be a terror to good conduct, we are to resist…even with our lives. And we can think of the countless Christian martyrs who refused to offer sacrifice to the Emperor in the opening centuries of the Church. Or of the overturning through the centuries of Christian authorities who had lost their legitimacy to rule. The Epiphany of God in today’s Gospel and Epistle is not that God will eliminate every danger to us if we are faithful enough. There will be storms in nature, in the spiritual realm and in the political realm: God will not take away every outward storm in our lives. But the Epiphany is this: there is no circumstance that can happen to us that is somehow outside of God’s providential care of us. And the sooner we turn to God in the storm, the sooner he will restore inward peace to us – not the peace of indifference or uncaring or blindness, but the peace of a loving, faithful heart, grounded on the Rock that is Christ. And He will see us through the storm. He will grow our faith, our courage, and our love in each storm. He will steady us. 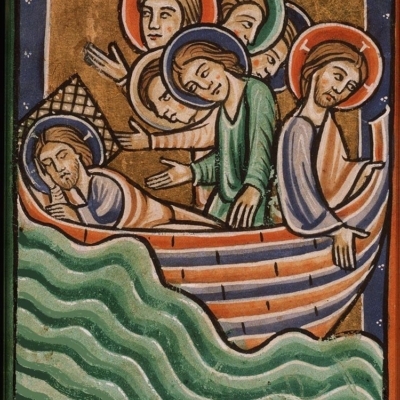 In our baptism service, there is a beautiful prayer that includes the line: that the baptized person may be received into the ark of Christ’s Church; and being stedfast in faith, joyful through hope, and rooted in charity [in love], may so pass the waves of this troublesome world, that finally [he or she] may come to the land of everlasting life, there to reign with [you] world without end, through Jesus Christ our Lord. By our Baptism, by our faith, Jesus is in our hearts, in the stern of the ship that is our soul. He is always there, ready to calm us, to help us steer right, to strengthen us and see us through this world to the next, if we should ask. Now, in our worship, Jesus promises to calm our souls through repentance and faith. As we receive Him afresh in the Holy Communion, let us ponder His presence within us, and give thanks and adore Him who brings inwardly, whatever the outward storm, the peace that passes all understanding.